For the past year or so, I've been working on adding new game file formats into a tool I originally created to convert files extracted from the Nintendo 64 ROM of Command & Conquer. In the past few months I finally added the classic C&C formats into the tool, and with the help of the people of the RedAlert++ project, I managed to make my tool create versions of these files that are virtually indistinguishable from the original Westwood-created ones, and, with some optimisations of my own, usually even better compressed. At a certain point in the development I stumbled on the Shikadi.net DOS Games Modding Wiki, and decided to document a bunch of the formats I had implemented. All existing documents on these formats are ancient, and many of them are full of inaccuracies, so since we gained so much knowledge from disassembling the exes in recent years, this was long overdue. The font formats are probably better edited with the Westwood Font Editor, though. They are included because this tool has the ability to convert them to sprite sheets. How to load unittem.pal for a TS SHP? You just put the palette in the tool's folder and it'll add it to the list. 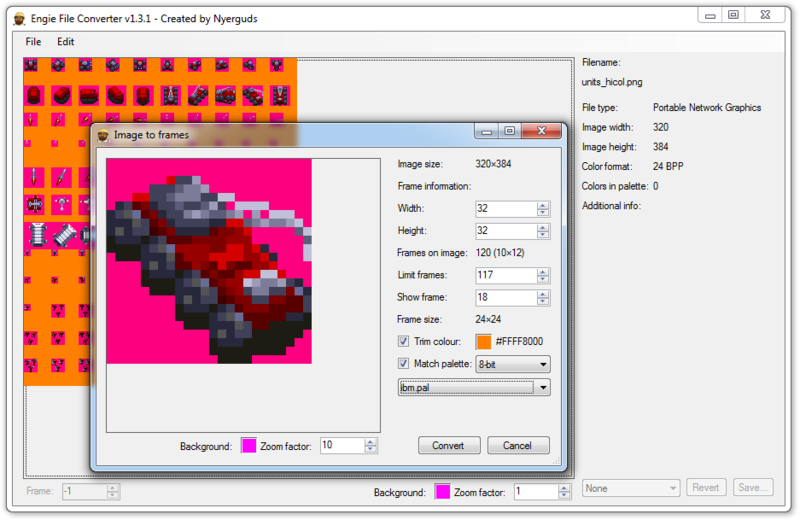 That said, any image can be saved as palette, so if you got some converted image of a TS SHP you can just open it, go to File-> Save, select "6-bit palette", and save it in the tool's folder that way. But you'll likely need a program restart to load it anyway. There are also still some bugs in the transparency handling of the palettes... at the moment it's forced by file type, rather than set to an initial state per file type, meaning it often can't be changed despite the palette editor having features to edit it. I still need to dig into that and clean it all up. The details from the SHP format is shown framewise, that is nice. A palettes sub-folder... yea, that could work. I will need to give this thing an options dialog eventually I guess. The reason the view is set to -1 by default is because the tool is a converter, more than it is a viewer, and switching to a frame will change all processing to be relevant to that frame rather than to the whole loaded sequence. So, if you select frame 0, and then go to File -> Save, you will save that one frame only, and will not get the options to save as frame-containing types. Changing it to frame 0 automatically would get especially tedious if you load a frames sequence into the tool to convert it (Open a file from a sequence and, like RAD Video Tools, it'll detect that it's part of a sequence and will ask to load it all), since you'd need to go manually back to index -1 to save it as the intended frames-containing file type. Uh, the Open dialog does use the last-used folder. In what situation didn't it do that for you? Do note that if you press "Cancel" on an "Open file" dialog, there is no way to retrieve what folder you were last in. Frame counter looping is impossible; it's is a standard Windows control. Also, not sure if it should go to frame 0 or frame -1 then anyway. 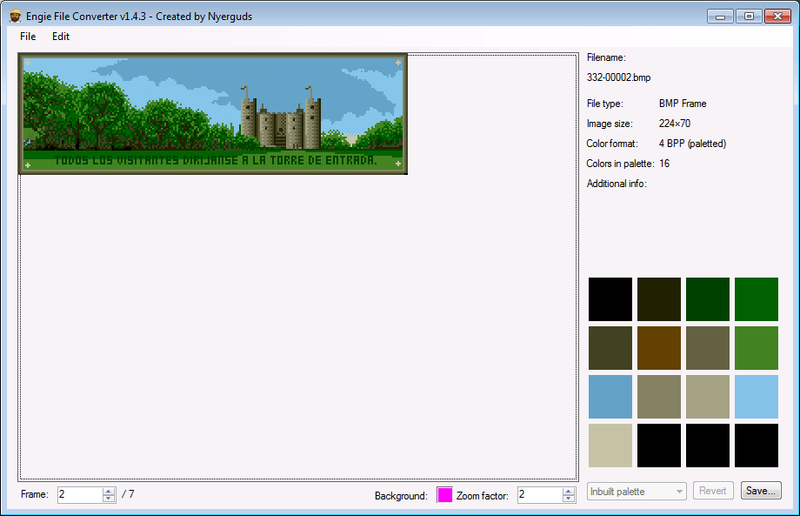 Background for TS SHP is automatically the first palette colour. What I said before was that the rule gets enforced on every palette edit so you can't change it even if you want to. Do note that that any transformation you do on the frames, like combining the shadows, will make it stop being a "Tiberian Sun SHP file" and will turn it into a general "listing of frames". These take over some properties of the original, but will no longer truly be treated as TS SHP files. When closing and restarting the tool, the open dialog is on the tool folder, not last used. 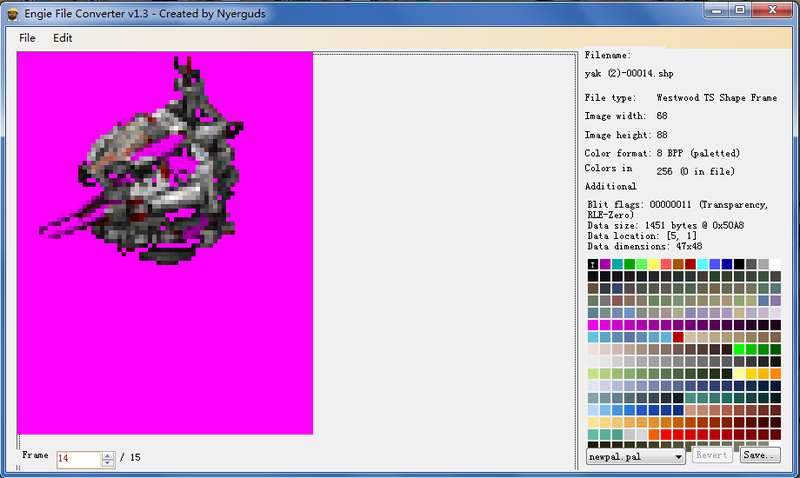 When I open a SHP file, then select the palette, the Background: for the image shown is still pink, was expecting the blue color from unittem.pal. Nothing gets saved if you restart it; the tool doesn't have any kind of settings file. If that bothers you, use drag-and-drop to load your files; it's faster anyway. The #FF00FF fuchsia is the default transparency colour; it can be modified by clicking the little coloured square at the bottom next to the word "Background:". The default 'background' colour on the TS units palette is black (as you can see on the palette viewer in the image I posted), which is not a very good colour for indicating transparency. Obviously, if I add a settings file, the selected background colour would be one of the things saved in it. Blue color I mentioned was from RA2's unittem.pal. I typically use it with TS's customised unittem.pal as well. Yeah, most palettes I work with from Dune II, C&C1 and RA1 have black as well, hence why I went with "nope, automatic override"
I released v1.3.1, which fully supports sprite sheets even if the frames in them have differing sizes, like they do in Dune II. It also has a palette matching feature for high colour content. And I fixed the forced transparency bugs; file type based transparency is now applied to all palettes once at the moment a file is loaded, but can be freely adapted afterwards. It'll be reset when a new file is loaded, of course. Would be nice if there were zoom out options for spritesheets too. Also after covering it to frames, it seems to upscale each image within the set frame-size, cutting off about 3rd of it. The Windows GDI+ system that's used by the .Net framework for graphics operations has certain upper limits, yea... it starts bugging out when you exceed a maximum possible image buffer size. And if you start zooming in on 3kx3k images I guess you'll get there pretty fast, yes. I've never seen it crash on that, though, usually it just bugs out a bit. Problem is, this is pure UI code, so nothing I can catch in a function. The closest I can do is check what these buffer limits are and restrict the zoom to stay below it. Yeah just limiting the zoom if it would bug out would be nice. I guess honestly I'm probably trying to do things with this program that it wasn't really designed for. I attached the spritesheet and some images showing the issue in a zip. On the first one... did you get that problem at 3x zoom, or when exceeding 3x zoom? I've been implementing a solution that maxes the control on an average of 10.000 * 10.000 pixels, but I'm not sure if this suffices. I may need to max out both dimensions at 10.000 instead. Sadly though, the control (a standard .Net PictureBox) does seem to mess up consistently when zooming too far, though exactly how far seems rather system-dependent. It's a side effect of it actually reserving the full amount of memory for the zoomed image. I've looked for alternatives online, but while there are optimised solutions of the "cut out the actual shown part" kind, those would come without scrollbars, making it quite hard to select the piece to look at. And implementing my own scrollbars... ehhh, not really something I'm too keen on. The reason this didn't show up in the preview was because the whole image-to-frames window works with a cloned version of the image, something I did for the sake of having the it in the most optimal format for repeated calls to to the cutting-up logic. Anyway, that one's an easy fix. Unless I go for percentages, that is, but that'd mean a complete overhaul of the zoom logic, since there are currently some logics in there that count on exact-multiples zoom. Pretty sure it did crash at 3x zoom, but now it seems to be working in the latest version. Didn't get any exceptions by zooming. The zoom out is nice too. Splitting that sheet into frames appears to work properly now too. Thanks! 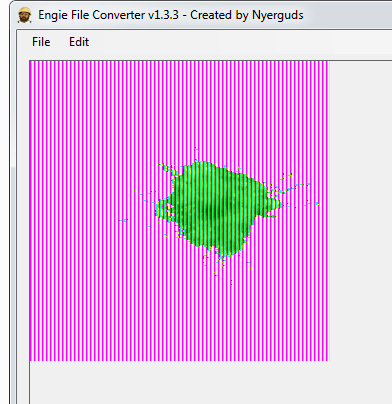 Well, after splitting another spritesheet into frames, got another strange result. and yeah it causes the odd vertical lines when give it 24bit image using the split but 32bit source is fine...go figure. I released a new version; the problem should be fixed now. Well, I can't really help with that. I can't just magically make this into a full editor with image shifting controls... that'd take loads of extra development. As it stands, this tool is only a converter. You'll need to use something like good ol' Gimp to solve that. I mean, you can always use this to convert it to frames, then dump those in gimp as layers to line them up, and re-save the frames you realign. The only somewhat related thing to that here would be the trimming code, but that was really just meant for handling file types with unequal frame sizes, like Dune II, and it works in tandem with the equivalent "fill around frames" option in the frames-to-image conversion. The TS SHP saving would reject frames of unequal sizes anyway. Mind you, I could put a simple "enlarge frames to same size" option... with the side options to select a fill colour, and to center instead of just filling the lower right. That's actually not hard at all. How can I convert a SHP(ts) file to SHP(td)? Or convert a frame sequence to a SHP(td) with a certain palette? When I try to save, the allowed format list does not include any SHP types. You have to keep the frame number at -1 (bottom left) and then do save to SHP formats as C&C1 shape. Edit: OK, I was a little late, you already found out. The tool does not do palette conversions, though... you have to do that yourself. 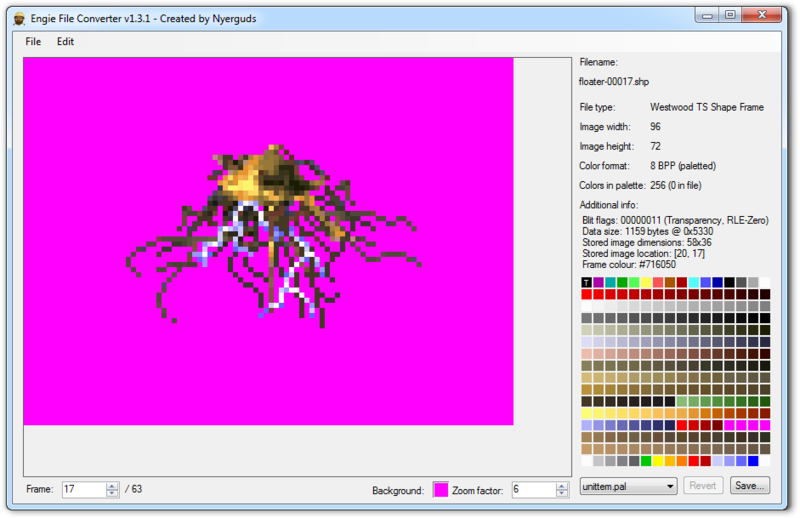 Though I guess a quick fix for that is to use the sprite sheet function so you have it as one image, open that in Gimp or something and convert it to RGB there, and then import it matching it to a TD palette. Haven't looked at your sources yet, but I suspect you use fixed window sizes, or relate them to text sizes. Chinese Windows installations have different font defaults, so .NET fonts are remapped with ones which includes both English and Chinese glyphs, resulting with the different font. Well I can understand the fonts being odd, then. But the sizing of the image viewer is all messed up too, and that's simply set to align to the top/bottom/left/right of the form. Same for the palette viewer; the buttons are not supposed to be on top of it. And that's all fixed in size. 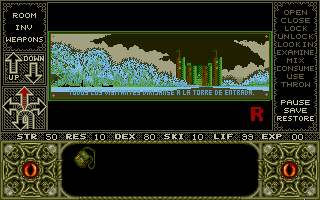 I'm experiencing problems when passing bitmaps, pngs, etc to vga files in Elvira, mistress of the dark. For example, in the file 332.vga there's a picture of a castle with a poster that says "All visitors report to gatehouse". With this tool, I get all the pictures and, in this case, edit this picture, respecting all colors. Newly, I return all pictures to the vga file, but when testing to see the results, they are very different.